ASCT2 is part of a larger family of similar transporters. To understand how this family of amino acid transporters works, and to help design drugs that block glutamine transport by ASCT2 or its role as a viral docking station, University of Groningen scientists have resolved the 3-D structure of the protein. They resorted to the technique of single particle cryo-electron microscopy, as they did not succeed in growing crystals from the protein, which are required for X-ray diffraction studies. The human gene for ASCT2 was expressed in yeast cells, and the human protein was purified for imaging. The structure was determined at a resolution of 3.85 Å, which revealed striking new insights. 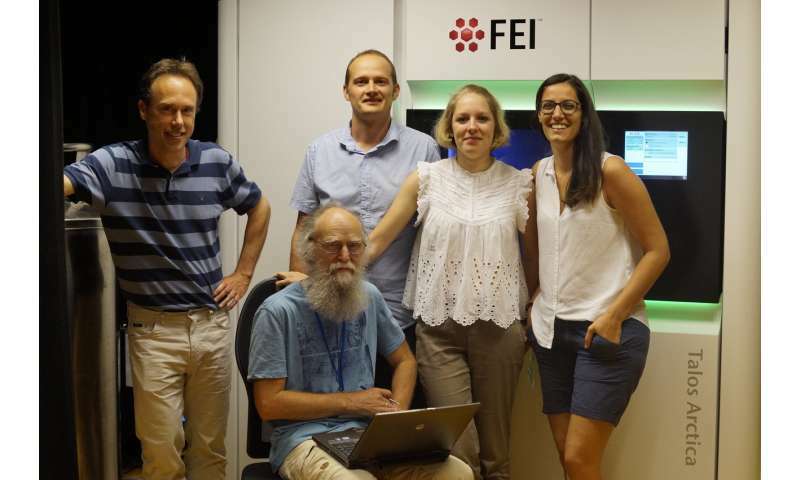 "It was a challenging target, as it is rather small for cryo-EM," says Assistant Professor of Structural Biology Cristina Paulino, who is head of the University's Cryo-EM unit. "But it also has a nice symmetric trimeric structure, which helps." The cryo-EM images reveal a familiar type of lift-structure, in which part of the protein travels up and down through the cell membrane. In the upper position, substrate enters the lift, which then moves down to release the substrate inside the cell. The structure of ASCT2 revealed the lift in the lower position. "To our surprise, this part of the protein was further down then we had ever seen before in similar protein structures," says Biochemistry Professor Dirk Slotboom. "And it was rotated. It had been thought that the substrate enters and leaves the lift through different openings, but our results suggest it might well use the same opening." This information could help design molecules that stop glutamine transport by ASCT2, says Albert Guskov, assistant professor in crystallography. "Some tests in mice with small molecules that block transport have been published." Blocking glutamine transport would be a way to kill cancer cells. "This new structure allows for a more rational design of transport inhibitors." Another surprise observation are the spikes that protrude on the outside of each of the three monomers. "They have never been seen before," says Slotboom. "These are the places where retroviruses dock." This is consistent with mutagenic studies performed by others. Again, knowing the shape of the spikes could help design molecules which block the viruses from docking. The protein structure was resolved in about four months, which is remarkably fast for cryo-EM. A multidisciplinary group of scientists worked in parallel, which sped up the process. Furthermore, Ph.D. student Alisa Garaeva, who is first author of the paper, played a central role in ensuring the project ran efficiently. Future studies will be done to capture ASCT2 in different configurations, for example inside a lipid bilayer rather than the detergent micelles used in the present study, and with the lift in different positions. Paulino, Slotboom and Guskov conclude that studying different states will help them understand how this protein functions.